Video Recipe - A little egg, oil, acid, a bowl, and a whisk, is really all you need. But although I have whipped mayonnaise from scratch more times than I care to remember, it can still fail for me. When I do it in a blender on the other hand, it almost always succeeds. The taste and quality is the same too. The easiest way to make mayonnaise is is by using a stick blender. Mix all the ingredients in a jar or similar with an opening large enough that the blender can go into. Then you will have no other washing up to do than the stick blender. Mix the oil in last. Wait until the oil floats on top, and the rest has sunk to the bottom. Then begin blending at the bottom in small pulses. It is important to start with the ingredients in the base. If you blender the oil first, it will not succeed. Pulse once a second and then wait a little. Pulse and wait, etc... Keep it up until you start to get white mayonnaise on the bottom. Then you can let the pulses become longer and longer, and you can slowly pull the blender out of the glass so the last of the oil is blended in. Blend until it has the right consistency. If it becomes a little too thin you can add some more oil. Blend it together for half a minute, maybe a little longer. Add the remaining oil in a thin stream while blending. If the mixture starts to become uneven, then blend a little without adding oil until it is smooth again. The more oil you put in, the thicker mayonnaise. Amusingly enough. It's done when it has the consistency you want. The mayonnaise can keep for up to a week. If it starts to separate a little, it is not a big deal. Just mix it with a whisk. If it is a large portion that has separated a lot, you can emulsify it again by putting an egg yolk into the blender and then slowly pour the separated mayonnaise in while blending. I find that most mayonnaise recipes to give too much mayonnaise, so I've gradually learned to halve the amount. I like mayonnaise, but only rarely do we we eat half a liter a week. If you need more, just multiply the amounts. A mayonnaise is an emulsion. That is, a combination of fat and liquid. All who have tried to make an oil vinegar dressing know it's hard to get oil and water to be uniform or homogeneous mixture. Oil and water repel each other chemically, and the oil is even lighter than water so it will float on top. When you whisk the oil and water it becomes small bubbles. The oil remains suspended in the liquid. Normally, one would expect that these oil bubbles would come together and join into larger bubbles. Finally, it would make a mayonnaise separate completely. But it can be avoided. For water and oil to stick together we have to use an emulsifier. This is what the egg yolk does in the recipe. Or rather, there is a natural emulsifier in egg yolk called "lecithin", which is the magic ingredient for making a homemade mayonnaise. Lecithin is an elongated molecule that attracts water at one end and fat in the other. The fat attracting end of the lecithin is stuck inside the microscopic oil bubbles. The other, water attracting, end protrudes outside the oil bubble. So there will be a layer of water outside the oil bubble. At the same time, the water attracting end of the lecithin is oil repellent. Pushing other nearby oil bubbles away. The fluid in between the oil bubbles is what keeps the mayonnaise liquid. Therefore, it becomes thicker as more oil is added., There is relatively less liquid between the oil bubbles. Be aware that the lecithin content of an egg yolk decreases as the egg gets older, so fresh eggs are a good idea. Then the mayo will separate less easily. 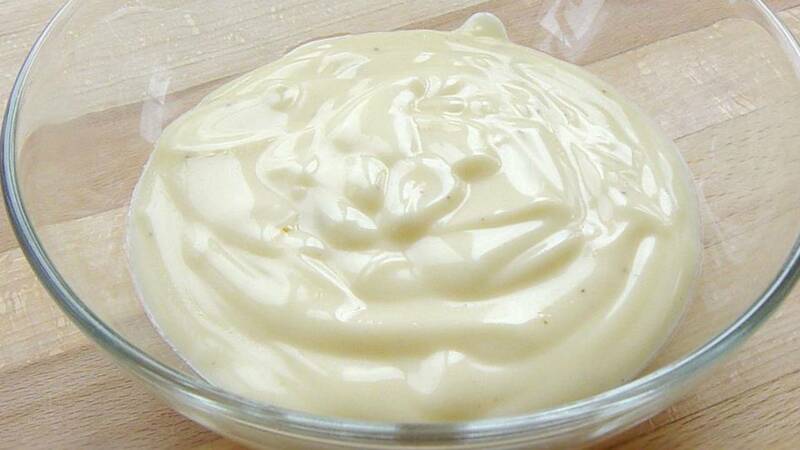 The other ingredients in the mayonnaise are there for flavor, use as much or little as you need. I was almost out of neutral corn oil recently, and had only cold-pressed virgin rapeseed oil in the kitchen. So I spent about half of each. It gave a very tasty mayonnaise. Virgin olive oil gives a very strong and characteristic flavor. Use it only if you know it is suitable for the dish. You can use room temperature bacon grease, instead of oil, for a bacon tasting mayo. Very nice for burgers. You can use all kinds of acid instead of lemon. Lime, apple cider vinegar, white vinegar, etc.., You can use more acid to counteract the fatty oil. Instead of pepper and mustard you can use other dried herbs. When it is finished, with the desired consistency. you can blend in some fresh herbs, or even garlic. Then you should eat it within a day.